Five men were found guilty of violence against a member of a community for attacking three participants of the Budapest Pride on July 6, 2013 while chanting homophobic and racists insults. Two perpetrators will have to go to prison, the prison sentence was suspended for the other three. The victims were represented by Háttér Society. The judgement is not binding. Tibor Derdák, János Orsós and László Glonczi, well-known in Hungary for their educational work in the Roma community, were heading home from the Budapest Pride march when they met a group of 20-30 protesters dressed in black, marching in a military formation. The group forced the three men to stop, shouted “You are faggots! You are gypsies!” at them, and beat them up. László Glonczi received the most severe injuries: he was kicked by several people even after falling to the ground. The assault ended when police arrived to the scene, however, they did not apprehend any of the perpetrators, nor did they check their identity. The inactivity of the police was met with widespread criticism, opposition parties and the Ministry of Human Resources condemned the attacks. Háttér Society organized a call for witnesses, and the attackers were identified via media footage of the counter-demonstration, and existing police files. The prosecution charged six men with violence against a member of a community committed in a group as well as causing light bodily harm. One of the perpetrators were acquitted during the court procedure, five perpetrators were found guilty. 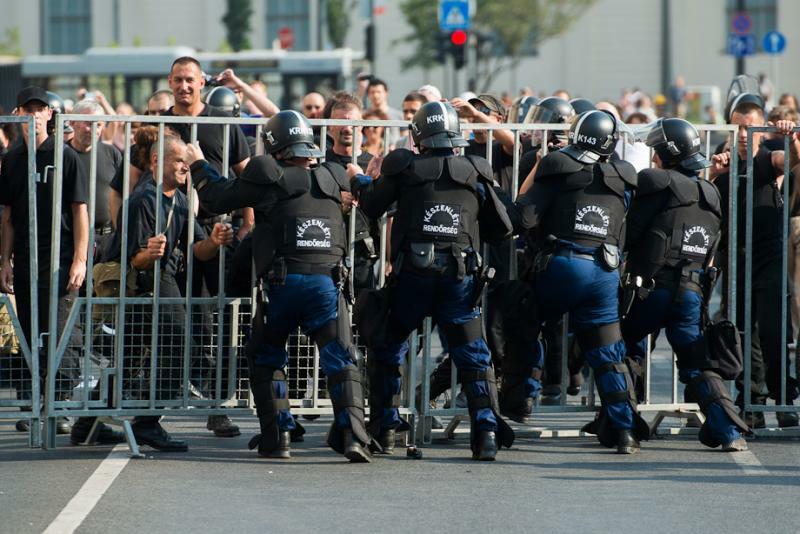 The investigation uncovered that all the perpetrators were members of the New Hungarian Guard, the successor organization of the Hungarian Guard, which was banned by the Hungarian authorities in 2009 for organizing marches that intimidated the Roma minority and disrupted the public order. Two of the perpetrators sentenced had a leading role in the New Hungarian Guard. The court found the testimony of the perpetrators against each other, a testimony of a fellow guard member and police tapping of the perpetrators’ mobile phones to be decisive evidence. Two perpetrators, who had a criminal record, were sentenced to three and two years imprisonment. The other three perpetrators received two years imprisonment suspended for four and five years.